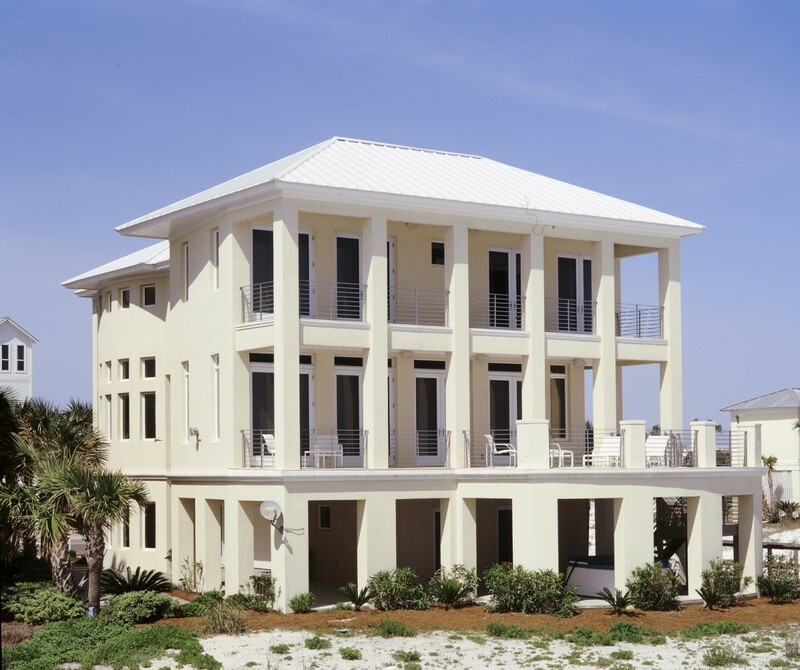 This house was built in Destin Pointe and was designed for a family from Atlanta Georgia. The client was a second generation manufactured home dealership, and was very knowledgeable about construction and materials. He understood the gestalt of quality, with craftsmanship and materials. This couple was one of the most generous and kindest we have ever worked with. They had season tickets to the Atlanta Hawks games and invited us to see the Chicago Bulls play in Atlanta. They put us up in a beautiful hotel for the weekend and even left his wife at home so our son could attend the sold out game. We were awed by their hospitality and generosity and our son still talks about this game! It was one of Michael Jordan’s last games before he retired from basketball! 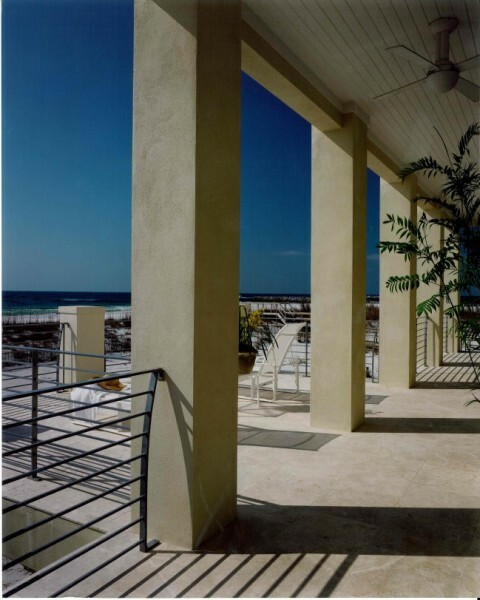 The lot selected in Destin Pointe was out on the end of a barrier peninsula with shifting sands. 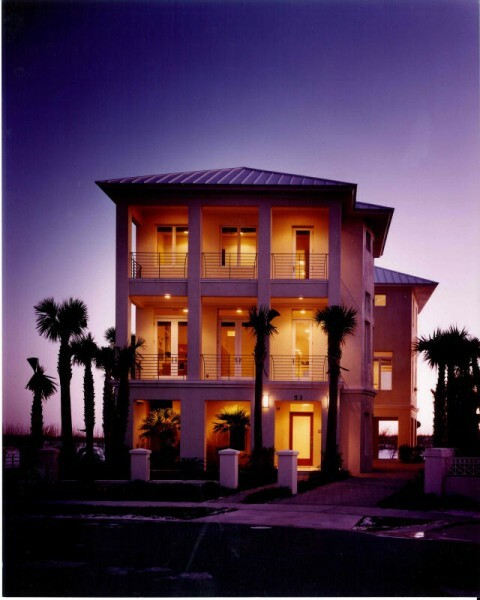 The project needed to be a design with breakaway walls, in the basement level, in case of tidal surges during a hurricane. The clients wanted a contemporary design, with a coastal twist. Many of the materials used in the project, were marine grade materials such as stainless steel, nautical canvas and upholstery. The location of the project was probably the most difficult. It was 50 miles away from our office and required driving through the Destin traffic during season. I would visit the job every day and some days, twice a day. Needless to say, I spent a lot of time on the road. I listened to lots of books on tape during this project. Finding a cabinet maker and welder to build the staircases and cabinets was the most challenging. Of course, we received bids from the large commercial cabinetmakers and welding companies but they were extremely pricey and out of the budget. We eventually found two local companies that worked on these projects for over 6 months to complete the fabrication and installation. I spent many days and nights visiting the welder and cabinet maker in their back yard shop to check on progress and encourage them to completion. It was well worth it, they both were true artists! The modern design and finish materials may look simple to the untrained eye, but the execution of this contemporary design, require detailed precision in the millwork and installation. For example, the poplar baseboard, was milled with an eased edge on top and 3/8 by 3/8 plowed riglet on the bottom and was placed on top of the travertine floor. The wall and floor surfaces had to be perfectly plumb and level, so the reveals would be precise and balanced. The cabinets were flush panels with flat panel doors of rift cut Ashwood. This clean finish look with minimal embellishments allow the natural materials to speak for themselves. The vertical grains in the Ashwood had to be lined up perfectly with special 10 foot lengths. 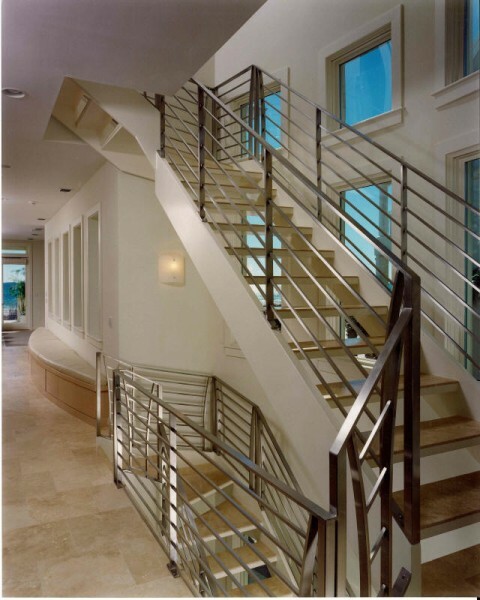 The stainless steel railing and floating staircase that was self-supporting on all three stories. It took over 6 months to build. It required each tubular piece of stainless steel railing to be fusion welded together and then hand polished to a brushed finish. When the staircase was completed and installed it looked like a piece of jewelry, a very large piece of jewelry, fit for a King! The powder bath glass bowl sink was one of the first vessel sinks, that in later years has become so popular and the absolute black granite countertop placed on top of the curved cabinet unit. It was such a statement piece.